Everest is the better strap in my experience. Quality is nice between both, but the Rubber B strap has a more fixed shape especially at the lugs. It will all come down to preference, and you may be able to find some shops near you that carry Rubber B. Check their website under retailers. I can’t speak to those two, but I did look at them to put on my GMTc. I ended up sourcing an oysterflex and some end links and absolutely love the rubber strap. Totally changed the watch and have a hard time taking it off to wear my expII now and then. Jerz, are you talking about the rubber bracelet on the Cosmograph? I spoke to Rolex and they weren't too keen to discuss selling me an Oysterflex. They went as far as saying, if you change the bracelet, it may have warranty implications. Love to see them try to enforce that piece of absurdity. Effectively, they're saying you can't buy a strap in-house but if you go aftermarket we'll mess with your warranty. Very odd. Horus... cheaper and same material. Quit paying more for a name. Much better alternatives out there. 150.00 per set. I am pretty positive the horus straps are silicon. The same oysterflex that’s on the yacht master as well. Most will not sell you the oysterflex unless you have one of the 2 models that come with it. Unless you have a good relationship with an AD and they just order it anyway or by chance by it form someone elsewhere. I don’t know how the could possibly void a warranty as if I had to send mine in it would be put back on the bracelet first. Everest has served me well. I've only had experience with the Rubber B on my BBN, and I'm extremely happy that I did end up going with them. I don't need to try any other brand at this point! I chose Rubber B over Everest for the taper of the straps, as well as the "beading" that makes it look more textured when compared to Everest. True, Rubber B is a bit more expensive, but at the price it isn't all that much more when it comes to overall happiness (in my opinion). I just know that if I went the Everest route, I'd probably still be pining for the Rubber B.
I prefer the Everest and have been very happy with mine. The only real negative with the Everest is you cannot use deployant clasps with it. Rubber B will work with them. Based on? 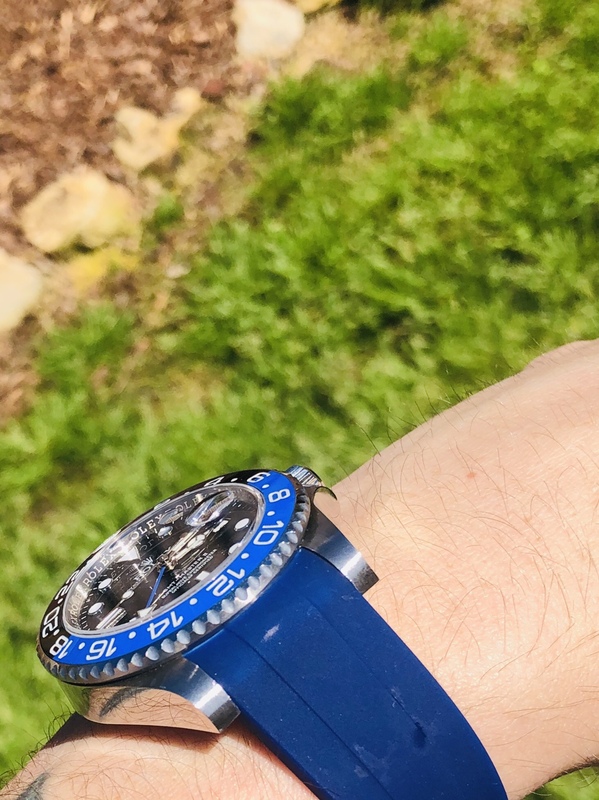 I tend to use my watches more on Oyster these days but RB make bands for brands higher than Rolex, they have a lot more different styles and alternatives, They are the only I've seen with the "Swiss Made" marking on their bands (if that even matters these days). Everest has the same exact band style for Tudors & Rolexes. The popularity contest probably belongs to Everest but they are certainly not better in quality. And Horus? thats pure silicone garbage. A dust magnet and extremely cheap. Anything over USD30-50 for a strap like Horus you are being fooled as a consumer. My friend, you don't see anything wrong with this? What is that white close to the bezel? That silicone is going to break on you without a doubt. Be careful. I have both. 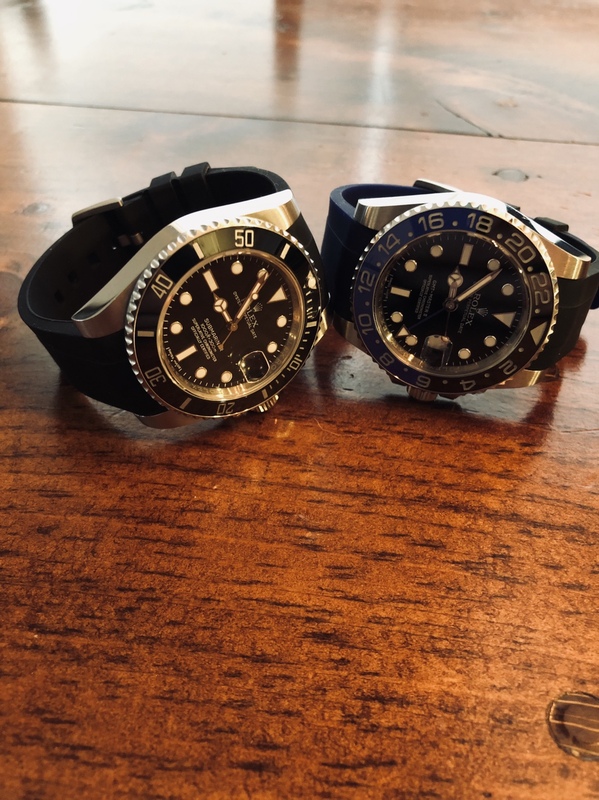 An Everest that I purchased and a RubberB that came as part of a second hand purchase. To me the Everest is better in every way. Fit,finish and the quality of the rubber. If I'd have purchased the RubberB new I'd almost certainly have returned it for a refund. Yep, I bought a rubber b fake on eBay not knowing. I called them because I was upset, they were very nice to me when they pointed it out. I made a claim on my credit card. I would not purchase again unless its a dealer or from their site. The strap had their logo and everything. I have purchased rubber b before and this strap was completely bogus. I agree on rubber b being the better product. Of course you can use the Rolex deployant with Everest. I first tried a RubberB but hated the fact it had to be cut to size, plus I don't like the raised "end link" rubber molding, I prefer the all-smooth Everest look. 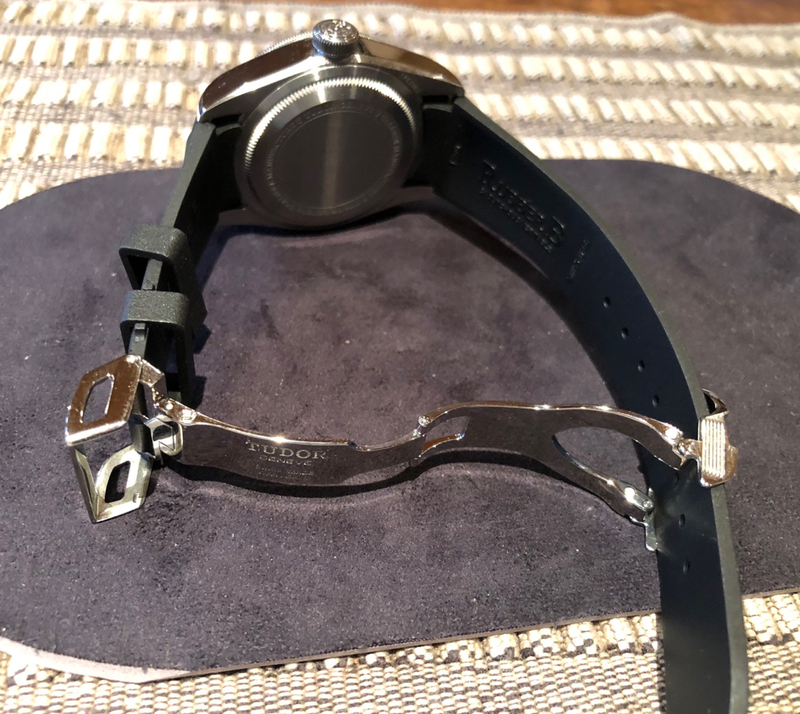 In this case I have my Explorer clasp temporarily setup with my GMT, only because I am having the original chrome PCLs fully brushed off right now...I hate the shiny bass-lure look and couldn't care less about resale. Can you show me how I would use an Everest strap with this style deployant clasp? I'm new to this, but my understanding was it would not work with an Everest. The company even said the same in an email reply to me. I used a Rubber B for Milgauss, easy to fix and change back whenever you feel like it. Rubber B is a better strap!! I used a Rubber B for Milgauss, easy to fix and change back whenever you feel like it. It has a nice green line which matches the Green glass. Everyone will have their preference but there was only one rubber strap I would use on my RG Daytona and that was the Rubber B. I had two. No, its not as soft as Everest, but to me it looks (and feels) a higher quality product. Sizing and fitting was easy. Yes, you need to cut it for the deployant clasp but that is not difficult for anyone with basic craft skills and, more importantly, ensures a perfect fit. Rubber B is unquestionably better for those with a smaller wrist due to the shape of the strap where it attaches to the case. No winner or loser here. Pay what you like. Both make a fine product. I also fan of the Rubber B.
I have both an Everest and RubberB currently, but I stumbled across some other brands on Instagram that seem to make similar vulcanized rubber straps. Can anyone share what the quality of these other straps are like? They are cheaper than Everest & RubberB. I've never had a problem with the lug width on the new subs/GMTs, but I think they look even more balanced on the rubber straps. I went for the Horus and was disappointed. Very thin and too short for 7.5" wrists.